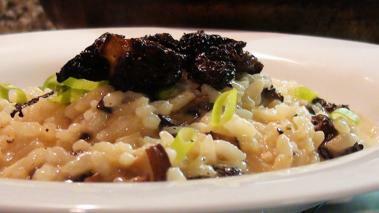 A good mushroom risotto is a thing of beauty. It’s even better when you can get your hands on some Morel Mushrooms. This morel mushroom risotto is fairly simple to make once you have the right techniques, and is sure to wow your friends and family. Now, morel’s only grow in the wild, and can be a bit hard to find at times. If you’re not able to lay your hands on some, go ahead and use what you can find, and I’m sure the risotto will turn out just great. Don’t over cook the risotto rice. In the space of about 7 minutes the rice will go from undercooked, to perfect, to mush. At about the 20 minute mark, you want to start tasting and once the rice become al dente, you’ll want to finish things up. The flavor in a mushroom risotto are farily powerful. And the richness of the cheese and butter will support a red wine with its tannins. I'd serve a nice, light Pinot Noir, which is one of my favorite matches with mushrooms. Enjoy!